Hang on a minute… isn’t this a goth, alternative and post-punk blog? Well of course it is, and Johnny Cash “the man in black” played a major, if unintended, role in the shaping of goth. His beautiful bass baritone voice, the overbearing religious content in much of his canon (couple with a constant fight against addiction), the stark, minimalist nature of his work and his final salvo of LPs recorded with Rick Rubin (which are as dark as the chambers of a dead nun’s heart – © Nick). And on those final LPs were the covers of the Mercy seat (Cave), Personal Jesus (Depeche Mode), Hurt (Nine Inch Nails), among many which are sublime. Enough said. First up is BOOTLEG VOL. IV: THE SOUL OF TRUTH, a 2-CD, 51-track collection which compiles gospel and spiritual recordings (both released and previously unreleased) made by Cash in the 1970s and ’80s. The tracks are traditional hymns and folk songs, as well as original composi­tions by Cash and many other songwriters. These recordings date from a period when his life was finally on an even keel, evidenced by “His excitement for his faith,” as the liner notes written by his son, John Carter Cash, bear witness. Johnny Cash didn’t live lightly. From picking cotton to help his impoverished, Depression-wracked family; to his exhausting tour schedule; to struggling with a serious drug addiction; to his songs about guns, murder, revenge, punishment and repentance—Johnny Cash was a troubled man who sought redemption through his music. To commemorate what would be the county-music master’s 80th birthday on Feb. 26, several celebrations, projects and events are scheduled throughout the year. Cash’s boyhood home in Dyess, Ark. is being restored. Columbia/Legacy will release a series of archived recordings, starting with a collection of his gospel and spiritual songs from 1970s and ’80s called Bootleg IV: The Soul of Truth, which will be available in April. A Johnny Cash Museum is scheduled to open this summer in Nashville. 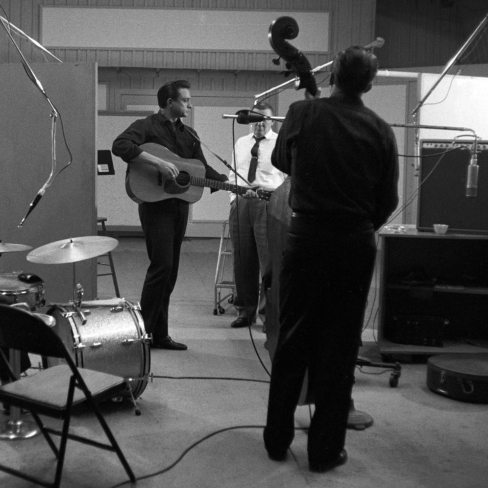 And here on LightBox we have rare and unpublished photos of the Man in Black from the Sony Music Archive. Many of these images were taken by Don Hunstein, a prolific music photographer at Columbia records for 30 years, and date from the late ’50s to the early ’70s; they include pictures of Cash and his wife June right after she gave birth to their only son, John Carter Cash, in 1970, as well as the musician at home in California or fishing on his farm in San Antonio.